This is a difficult problem to fix because most of the time it is cultural; deep rooted customs or practices in which business is being conducted day to day. This is not a situation where a set of protocols will solve the problem. So how do you implement this change? What is the solution? 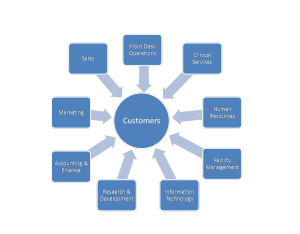 How do you create a Customer Centric Medical Practice? It starts at the top, do not even attempt to spend time improving customer service unless you, as the physician or manager, are willing to completely embrace the process and lead by example. You must become a Customer Centric Leader. Practice makes perfect. You need to show not just tell your team what excellent customer service looks like. Script each interaction that your team has with your customers (phone and in person). Then hold a team meeting where everyone is involved in the role playing of the scripts. Make every business decision based upon the customer. Hours of operation, quality of care, accounting practices & principals, phone system, staffing levels, equipment purchases, facility management, etc. Each time you make a business decision ask yourself and your team: “with this decision will customer service improve, remain the same or be reduced?” Based upon the answer to the question you should have your decision.